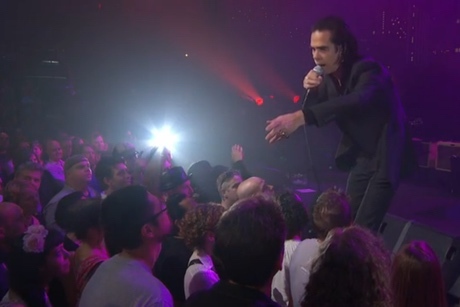 Nick Cave's live shows are legendary, and now you can enjoy a performance from the singer and his band the Bad Seeds from the comfort of your own home. Last night (November 1), an hour-long set from the group aired on Austin City Limits, and it's available to stream now. The set featured nine songs, ranging from early material to songs from last year's Push the Sky Away. This rendition of the classic cut "Red Right Hand" sounds a hell of a lot different than PJ Harvey's recent cover, and Cave gives it his all during the passionate performance.